Michael Fegan - first goal for club on Saturday. At the start of the season survival was the target for Dollingstown, but now their promotion charge is gathering momentum. 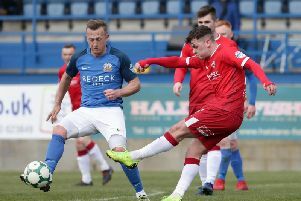 Their latest outing saw them smash six past Ballymoney. The match was 40 minutes late in kick-off due to the referee thinking it was a 3.00pm start. Ballymoney played with the wind advantage in the first half and nearly went in front on three minutes from a free kick that was well saved by keeper Keith Fletcher. However two minutes they did go in front when full back Francis McKenna scored direct from a penalty. Dollingstown didn’t equalise until the 29th minute when Andy Hamilton played Ritchie Thompson through and he scored low into the corner. However three minutes later Ballymoney went in front again from a wind assisted free kick that flew direct into the net. In the second half there was a huge hail storm for five minutes and during this time the visitors went in front for the first time when leading scorer Thompson flicked home from a corner kick. Then Adair sealed the game when his wind assisted cross went through everyone into the net to make it 4-2. Fegan then headed home superbly from another corner and Thompson went on to complete his hat-trick on 79 minutes. This was not a very impressive team performance by Dollingstown although the conditions were very tough and given the other results this was a big away win for Gary Duke’s side. This week Dollingstown are on the road again away to Limavady United who trounced Annagh 6-0 in Portadown and this is quickly followed by another away game against Glenavon in the quarter final of the Mid Ulster Cup on Tuesday night and again then the following Saturday home to the inform Carrick Rangers in the last 16 of the Intermediate Cup. Manager Duke will use these three matches to get all members of his squad some game time including latest new singing on deadline day Glenn Hand from Nortel who has past Irish League experience with Larne. Dollingstown: K Fletcher, J Redpath, A Moffett, K Robinson, A Walker, G Ringland, A Hamilton, B Adair, R Thompson, M Fegan, C Kingsberry . Subs used: R Donaghy, M Denver, C Cunningham.